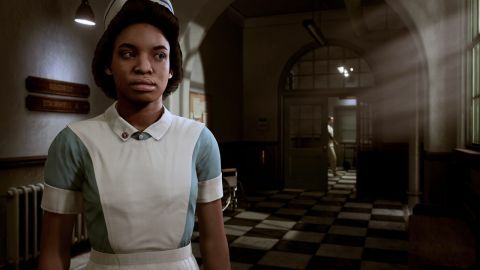 The Inpatient review: "It's all utterly brilliant; terrifyingly so"
The Inpatient excels at immersing the player, and it looks gorgeous. Unfortunately it puts too many barriers between the player and ultimate success. With the launch of Skyrim VR and Doom VFR, along with a brilliant tech demo for the Last Guardian where you can actually pat the dog, it’s clear that Sony is pushing to make PlayStation VR really work. There are plenty of PSVR titles coming along that should make it an exciting year for virtual reality, and The Inpatient is a strong start to 2018. It’s also one of the finest, smartest horror games I’ve played in VR. Made by Supermassive Games, the same folks behind Until Dawn and Until Dawn: Rush of Blood, this is a first-person horror that genuinely puts you, the player, at the centre of the story. The first thing it does is strip you of all your memories - a great way of making the entire story a mystery. All you know is that this game is set 60 years before the events of Until Dawn, and you’re stuck in the Blackwood Pines Sanitorium with no idea who you are, how you got there, or why you’re stuck there. Wiping a character’s memory isn’t exactly a new idea, of course, but combined with another gameplay feature it keeps you utterly immersed in the game from the opening moments. That other feature is giving you a voice. Not some in-game pre-rendered vocals either; your actual voice. The game features voice controls, which means when you’re presented with two dialogue options you can merely say the lines out loud to trigger the next scene. And yes, you can get properly into it, because at one point I was yelling “Why am I here?” into the doctor’s face with actual venom. My neighbours must think I’m mad. For what seems like a simple mechanic - it uses the in-built microphone in the PSVR to hear you speak - it totally changed the way I felt about my character and the situation we found ourselves in. Suddenly it was me that was stuck in the Sanitorium and not just some nameless, faceless protagonist. This is VR immersion at its best, and that really ramps the horror factor up to 11. It also helps that The Inpatient is the most visually impressive PlayStation VR game. Like in Until Dawn and Rush of Blood, Supermassive has absolutely nailed the motion capture in The Inpatient, with every expression and emotion coming across strongly on the characters’ faces. The opening scene of the game has you strapped to a chair with a doctor asking you questions, leaning in close to tell you that although your treatment is hard, it’s also working. He gets so close you can see the wrinkles on his face and almost feel his breath on your cheek. It’s all utterly believable; terrifyingly so. Like Until Dawn, this is a game that reacts to your narrative choices and the actions you take. But that’s almost it’s downfall. Much of the story hinges on you finding items that trigger your memories, and these explain what the heck has happened to you, but unless you go searching for them the first time you play through, you’ll have literal gaps in your memory collection and the closing moments of the game will leave you with plenty of unanswered questions. With a playthrough only lasting around two hours, you might also be left asking why the heck you’ve paid $39.99/$34.99 for such a short experience. But, it’s actually a game that benefits from multiple playthroughs. In fact, I absolutely urge you to play it through at least twice. Immediately after finishing it the first time around, I started it all over again, taking different pathways, choosing different dialogue options, and making sure to find as many memory triggers as possible. It’s remarkable just how different my experiences were between playthroughs, and how big an impact a seemingly mundane choice makes, with some scenarios playing out as starkly contrasting as night and day. I won’t ruin exactly what happens, as it’s worth discovering the twists, turns and scares for yourself. The second playthrough made all my concerns from the first melt away, but that won’t detract from the fact I got disheartened by a relatively disappointing first playthrough. There are a few other niggling issues with The Inpatient, mostly with the control scheme. You’ve got options for 15, 30 and 45-degree turning increments - or you can opt for completely free movement - but none of them seem to work for the intricacies of navigating the many doorways and corridors of the Sanitorium, regardless of whether you use a regular DualShock 4 pad or the Move wands. I spent a lot of time banging my metal torch against the wall, stuck on a wall or at slightly the wrong angle to actually glide through each door. Thankfully, the story is intriguing enough to carry you through repeated playthroughs despite the movement issues. It’s hard to know how to recommend The Inpatient. On the one hand, it’s one of the most creative horror games in terms of (eventual) story revelations and gameplay mechanics. But on the other, it requires plenty of player patience to get the best out of it. It’s 100% worth the effort once you realise how the game works and what it’s trying to achieve, even if the results of your initial playthrough inevitably feel a little underwhelming. if you want more horror in your life, head over to our best horror games.